How do I get screenWidth and screenHeight in the main Activity? Note that the height returned by these APIs will be LESS THAN the device's physical height because the button bar height is subtracted. For example: On a Moto X4 it returns the correct widthPixels (1080) but it returns a height of 1776 even though the device's screen is 1920 pixels tall. If you are in a fragment and want to acomplish this just use Activity.WindowManager (in Xamarin.Android) or getActivity().getWindowManager() (in java). For the use case you're describing however, a margin/padding in the layout seems more appropriate. "The absolute width of the display in pixels." No way u can do it in the XML? @ Abhishek Susarla : XML usage is general used in a static way you should expect anything to be done dynamically, hope this helps you figure out ur problem. well explained MR Mido. A lot of people who are new to Android don't understand the purpose of the XML files. Thanks @jcfrei ! - I refactored the answer appropriately. If you use display.getWidth() be sure to set your minSdkVersion to at least 4 in AndroidManifest.xml or you will get incorrect results on some devices. Interesting discovery: in the emulator (Android 8) I've specified "Abstracted LCD density" as 150, but when I look at DisplayMetrics.densityDpi it shows 160.
getWidth() or getSize()? What would I use if I need my app to run on API <13 as well as API >13? Good point! I'd bet the majority of devices running API>=13 would less suffer of this than devices running API<13 in terms of performance. Also this would still work until the getWidth is really removed and not just deprecated. Any Android guy to confirm this? I don't see why you want to use try/catch for such a check? Why not simply use if (android.os.Build.VERSION.SDK_INT >= 13) without any thrown exception at all? I think of try/catch in a normal app-flow as bad practice. @CipherCom at least because it might become deprecated as well. @A-Live then the app would break as well (but not crashing). We developers must pre-check a new os version nevertheless and this maybe just conceal a problem. Also with this argument one could/should surround every few code lines with try/catch, which in my opinion is bad practice as mentioned already. @CipherCom as a developer, you must understand the difference of the general and device dependent code, the latter is always better to use with try/catch at Android world in my opinion. And by try/catch I don't mean spamming exceptions at log but preparing a fallback functionality like using default values. @Josef How do the software buttons affect these methods? what is 'ctx' in the above code? Is that a reference to something not defined in the code snippet? @WildBill ctx is a Context variable. If this answer gets you wrong screen sizes, see this related question for an extra necessary step. You should use the WindowManager form activity.getWindwoManager(). Else when entering multi window, you will receive the size of your app in full width mode. Above answer won't work if the Display class will not work then you can get the width and height by below method. I have a splash screen activity with a LinearLayout as a root view that has match_parent for its width & height. This is the code in the onCreate() method of that activity. I use these measures in all other activities of the app. 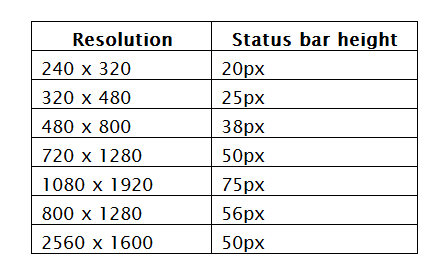 This results in the height and width of the usable display, excluding any type of bars (status bar, navigation bar), for all API versions and different types of devices (phones and tablets). It is deprecated, and you should try the following code instead. The first two lines of code gives you the DisplayMetrics objecs. This objects contains the fields like heightPixels,widthPixels. Note that the metrics (width, height) change depending on the rotation of the device. Metrics will return the size of the display, but HoneyComb and up, your activity will have less space than what's returned due to the system bar. final float scale = getResources().getDisplayMetrics().density; int width = (int) (metrics.widthPixels * scale + 0.5f); - You have to account for device density when doing it that way. This should be the accepted answer as it is Platform independent. @Armfoot to sway rounding without a lot of excess code. getActivity().getResources().getDisplayMetrics().widthPixels‌​; from within a fragment. Does this actually return back the device screen size or the device screen resolution? This function returns the approximate screen size in inches. First get view (eg. by findViewById()) and then you can use getWidth() on the view itself. This is actually how the documentation tells you to do it... but it's kinda pointless if you are NOT using a view. you may be using something else, e.g. mglsurfaceview. The variable result gives the height in the pixel. For more information about height of Title bar, Navigation bar and Content View, kindly look on Android Device Screen Sizes. Just what i needed! getResources().getDisplayMetrics().heightPixels + result gives actual fullscreen height. Dragan Marjanović's answer also works but I prefer this much shorter and simpler solution. This approach is outdated as of Android Marshmallow. Status bar height can change from device or Android version. Better use OnApplyWindowInsetsListener. Of course the deprecated methods will eventually be taken out of the the most recent SDKs, but while we still rely on most of our users having Android 2.1, 2.2 and 2.3, this is what we are left with. Yeah, this was back in 2012. If getSize gets you an error due to your minSDKVersion and you don't want to use deprecated methods (getWidth & getHeight), the getMetrics solution was originally posted on 2011 by Balaji.K... And Nik added a comment explaining getDisplayMetrics also considers the status bar size. Some other comments refer to multiply by the scale (density) in order to get the precise float value of the dimensions. Tested in Android v2.2 (API 8) and v4.0 with good results and no errors/warnings. Simple function compatible with lower versions as well. String str_ScreenSize = "The Android Screen is: "
Using this, we can get the latest and above SDK 13. Show width and height according your screen resolution. You need to add @SuppressLint("NewApi") just above the function signature in order to be able to compile. I think it's better to get the height and width in one go rather than in separate calls to the APIs because otherwise they could be out of sync. This could happen if the screen orientation is changing while your code is running. This is the only post here that takes into account the window decorations (statusbar/menu bar). worked great for me. Awesome, however you should never have expected business logic fire exceptions. Exception firing(even when caught) is horrible for performance. Plus you are doing more work than needed if the SDK_INT is > 13. Instead, you should just add some ifs on the Build.VERSION.SDK_INT. @Erik B, I agree. I added improved version. Still I left the part "since SDK 1" just in case something goes wrong in try/catch (I've seen many bad things in Android especially when you think it's impossible something to go wrong so I like to keep it safe :)). Anyway there shouldn't be too mouch overhead since this calculation should be done only once (e.g. values could be kept in some static attributes). Note that this code is licensed under GPL v3 which has implications for using in production apps. Why reflection, if the function is actually available for API 17 : developer.android.com/reference/android/view/… ? Anyway, this doesn't take into account the current orientation, so it will switch according to it. Here's a solution that will work the same no matter is the orientation: stackoverflow.com/a/47684256/878126 . However, the question of the thread is about the normal sizes, so it doesn't need the real resolution. Just the part that can be used. If using getRealMetricts() you're going to get the full size with windows decorations and these things; just in case someone is wondering how to do this without reflection. Then findViewById(R.id.entireLayout).getWidth() will return the screen's width and findViewById(R.id.entireLayout).getHeight() will return the screen's height. There are times when you need to know the precise dimensions of the available space for a layout when in an activity's onCreate. After some thought I worked out this way of doing it. // Return without setting the layout, that will be done in onActivityResult. // Probably can never happen, but just in case. // Create a LinearLayout with a MeasureFrameLayout in it. // Just putting a subclass of LinearLayout in works fine, but to future proof things, I do it this way. // measureFrameLayout will now request this second activity to finish, sending back the width. // Send the width back as the result. // Tell this activity to finish, so the result is passed back. // First time in, just start another copy of this activity. // Second time in, here is where the measurement takes place. // Width is now set to the precise available width, and a layout can now be created. // Tell the (second) activity to finish. Obviously, you can also pass back the height in the bundle too. Isn't this a much better solution? DisplayMetrics comes with everything you need and works from API 1. You can also get the actual display (including screen decors, such as Status Bar or software navigation bar) using getRealMetrics, but this works on 17+ only. It's not subtracting space for on-screen controls (such as on Tablets or Nexus devices). Also, I get a different value (750 vs 800) on my 10" Tablet, depending on whether the Activity is active when the calculation is done. But for my purposes, this is more than fine. Thank you! [SOLVED] how to get android screen size programmatically, once and for all? Android – Am I Doing this Right?